We are pleased to present Birch Hill, ready to furnish as a small town house, country guest cottage, or a luxurious summer house. Constructed of solid pine, birch plywood, basswood and maple, with a hand-painted stone and brick exterior. Five rooms include kitchen, dining room, parlor, bedroom and dressing room/bath. Asymmetrical steps lead from the garden area to the formal entrance on the first floor. A unique roof light brightens the second floor with its side balcony. The steps and terraces provide ideal areas for plants, flowers and seasonal color. Birch Hill is wired for electricity. Walls, floors, ceilings and mouldings are finished and move-in ready. The upper levels feature hand-laid maple floors, and the ground floor rooms have hand-painted stone floors. The parlor includes a fireplace with mantle and built in bookcases on the side. All walls are finished in a neutral white. Shown below furnished as an estate manager's office. Dimensions: 24" wide, 19" deep, 32" high; 1:12 scale. Available for purchase. For more information please email: info@markturpin.com. Birch Hill was featured in the November/December 2018 and January/February 2019 issues of Dollhouse Miniatures Magazine. To order copies, visit: dhminiatures.com. Request DHM 66 & DHM 67. The doors are open at Palisades...our brand new contemporary house, available now, one-of-a-kind. Palisades is a dramatic four-story design with seven rooms including a double-height living room. Dimensions: 29.5" wide, 20" deep, 41" high; 1:12 scale. Over 1200 square inches of living space. The exterior is hand painted and clad with hundreds of hand made faux stones. Interior ceilings and walls are primed/painted a neutral white. Available for purchase with unfinished or finished interior. Scroll down to view the photos. 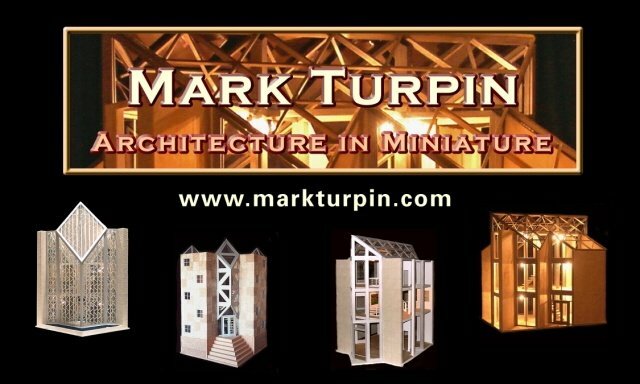 For more information please email: info@markturpin.com. Palisades is featured in the March/April 2019 issue of Dollhouse Miniatures Magazine. To order a copy, visit: dhminiatures.com. Request DHM 68. A two room garden villa, pavilion or memorial, Paradisum features a hand-painted stone exterior and a barrel vaulted roof light. Dimensions: 14" wide, 11" deep, 18" high; 1:24 scale. Scroll down to view the photos. Available for purchase. Ready to decorate and furnish. Main staircase, doors and windows are in production. Interior design/finishing is available. For more information, email: info@markturpin.com. Symphony is a decorative table lantern featuring a hand painted faux stone exterior. Sixty parallel interior mirrors reflect ever-changing LED lights creating a symphony of color. A sparkling background also reflects the light. The small interior is an ideal display space for a fine miniature musical instrument, such as a harp, or a chair with cello, music stand, etc. Scroll down to view the photos. Dimensions: 7" x 5" and 15" high, on an 8x10 base; 1:12 scale. A quartet of tiny rooms within a small castle structure, Stonegate is a unique new table top miniature inspired by gatekeepers' lodges. Dimensions: 11" x 14" base; 20" high; 1:24 scale. Available for sale. Scroll down to view the photos. Inspired by the architecture of Hollywood's Golden Age, this 1/2 scale storybook cottage, currently in production, features five cozy rooms plus an attic and cellar. Dimensions: 12 x 16 inch base; 24" high; 1:24 scale. Currently in production. Structural work and exterior trims are finished; work continues on the roof and tower. Available soon. For more information, email: info@markturpin.com. A follow up to the popular custom house named Lurie Lane, Laurel Lane is a three-story suburban home available on the half scale (1:24) or quarter scale (1:48). Dimensions: pending per scale; in design review. Available for purchase with finished exterior and finished or unfinished interior. To view Birch Hill, Paradisum, Symphony, Palisades and Stonegate, click on the thumbnail views below to enlarge the photos and start the slideshow.